The second season begins soon. The last time the Spurs didn’t make the playoffs, I was 11 years old. While it is no lie to say I am a lifelong Spurs fan, I will readily admit I was not regularly watching them back then. I knew who David Robinson, Sean Elliot and Avery Johnson were and longed to meet them in person like any kid. My uncle, who managed a big and tall men’s clothing store popular among the Spurs, knew most of them and took me and my sisters to games every now and then with tickets they would give him. Still, I was only in fifth grade, my mom had semi-strict television rules, and we had too many after-school activities (soccer practice, violin lessons, etc). A few years later, I was an A-student in middle school with my own TV and the trust of my mom to get my homework done before watching, so the 1999 lockout-season was the first one I watched all the way through, and I was hooked. I read the sports section of the San Antonio Express News (and later, the internet) every day after school, watched the games when time permitted, and rooted for the Spurs religiously. Suffice it to say, as a spoiled Spurs fan with typical first-world Spurs problems, I do not know life outside the playoffs, and that’s not about to change any time soon. The Spurs are entering the final week of the season with one goal in mind: gel. After a meaningless but still disappointing week of 2-2 basketball that included plenty of rest but zero consistency, Coach Pop has stated that he’s done with resting and wants his team to treat these final two road games against the postseason-bound Portland Trail Blazers and Utah Jazz like they are the playoffs. That likely means we should expect to see him do the same and stick to his desired playoff rotations, and if they heed his words, the Spurs should be playing with more intensity than we saw last week. They’ll need to pick it up, because while they’ll be heavily favored in a now-guaranteed first-round series against the Memphis Grizzlies, it will be no cake walk by any stretch of the imagination, and anything less than 100 percent could result in 2011 all over again the unthinkable. The Spurs will rank as a top-five defensive team for the fifth straight season and the 16th time in the 20 years since they drafted Tim Duncan. That they’ve done it without Duncan is a credit to Kawhi Leonard and their depth. 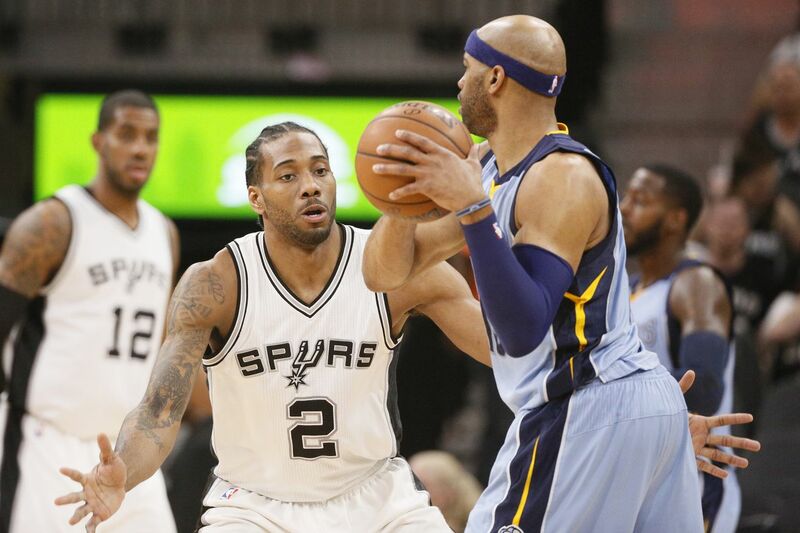 The strength of their bench won’t be as much of a factor in the playoffs and with no high-scoring wings on the Grizzlies, it will be interesting to see how much Leonard defends Mike Conley. He did so for just a little over two minutes in the three games he played against Memphis in the regular season, when Tony Parker was the primary Conley defender. No matter how the East plays out, Spurs-Grizz could be the lowest-scoring first round series for the second straight year. Right now, don’t have the look of a team that can beat the Warriors four times. But: they’re 4-0 against the Warriors and Cavs this season. Can’t count the Spurs out. The Spurs are locked in as the No. 2 seed in the West, but coach Gregg Popovich isn’t planning on resting any of his players against Portland and Utah to close out the season. I wonder if Kawhi will retire with more analytic hipster MVP awards than anyone else, but also without any actual MVP trophies. It might take a couple playoff series to remind the masses how not-boring he is on the court, but it sure feels like his time is coming. San Antonio’s regular season was phenomenal. You can point to so many players who had good, really good seasons, but none outside of Kawhi Leonard, who had an unforgettable season. They just all bought in, played disciplined, smart basketball, and were led by an elite talent. Gregg Popovich continues to mold his team structures around whatever he has to work with, and that flexibility, more than anything, is what makes him such a great coach.